Media Library Catalog was designed to give the churches library ministry a cost effective and functional way to catalog, search and report all any type of resource the library may have in its collection. 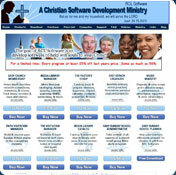 The church defines all of the lookup files which give a tremendous amount of flexibility. Define the types of resource, report codes, location types, and status options. Search on title, author, subject, series or keywords then print the results. You can maintain the names of individuals who have donated resources to the library. If the donation was made in remembrance of a person this too can be entered. Reports can be printed for either of these options. Media Library Catalog was specially made to catalog , search and report any type of resources that the churches library ministry have in their collection. Print out an accession listing of all of the resources in the library or just print a report with for one or two report codes. The report codes are based on the Dewey decimal system. With the click of a button you can do an analysis of all the librarys resources. See the total investment, the count, and the percentage and total dollars for each report code, defined resource, reading group and resource type. Our Backup and Restore Wizard uses the latest ZIP technology. The program was designed to be easy to learn with a user friendly interface. A volunteer who is only able to donate a few hours a week will not have to spend the first hour reviewing how to use the program. · Export to MS Excel using our query generator. Microsoft® Excel required. · Export to flat ASCII or delimited ASCII. · Import from flat ASCII, delimited ASCII, DBase or MS Excel. · Upgraded the query generator. · Telephone, zip/postal codes and states now accept International data. · Maintain and Report on Donors and Memorials. You cannot download any crack or serial number for Media Library Catalog on this page. Every software that you are able to download on our site is legal. There is no crack, serial number, hack or activation key for Media Library Catalog present here. Our collection also doesn't contain any keygens, because keygen programs are being used in illegal ways which we do not support. All software that you can find here is freely downloadable and legal. Media Library Catalog installation package is prepared to be downloaded from our fast download servers. It is checked for possible viruses and is proven to be 100% clean and safe. Various leading antiviruses have been used to test Media Library Catalog, if it contains any viruses. No infections have been found and downloading Media Library Catalog is completelly problem free because of that reason. Our experts on malware detection tested Media Library Catalog with various spyware and malware detection programs, including fyxm.net custom malware and spyware detection, and absolutelly no malware or spyware was found in Media Library Catalog. All software that you can find on our servers, including Media Library Catalog, is either freeware, shareware or open-source, some of the software packages are demo, trial or patch versions and if possible (public domain licence), we also host official full versions of software. Because we want to be one of the fastest download sites on the web, we host all the software including Media Library Catalog on our servers. You cannot find here any torrents or download links that would lead you to dangerous sites. Rate Media Library Catalog 7.5!